We’ve been to Taal Heritage Town in Batangas three times before but we always seem to stumble into something we’ve missed the previous times we’ve visited. Nothing much has changed the last time we came over but this time we made sure to tour the interior of one of the more famous residences here and learn more about the people who had lived there. Taal Heritage Town is a collection of 18th to 19th century Spanish colonial-era ancestral houses, the majority situated right along the Calle Marcela Mariño Agoncillo, the main road through town. Accompanying two new friends, Jack and Helena, we parked near the end of this road at a basketball court near the Taal municipal building and proceeded to tour the various structures on foot. First on our list was the Basilica of St. Martin of Tours – the biggest church building in Asia, first constructed in 1755. The size of the structure doesn’t look that big from outside but its 291 feet length, the same dimension in height and 157 feet width becomes apparent once you peer inside and observe its imposing vaulted arches. From the basilica we strolled towards Calle Gliceria Marella, a street parallel to Calle Marcela Mariño Agoncillo. This street is named after Doña Gliceria Marella de Villavicencio, whom the government of Emilio Aguinaldo named the Matriarch-General of the Revolutionary Forces in 1898. This was in recognition of the valuable services she rendered to the Philippine Revolution beginning with her huge monetary donations to Jose Rizal’s Propaganda Movement and her distribution of its writings. Suspicious Spanish authorities arrested her husband whose health failed in prison and died 3 months after his release in 1898. Gliceria continued supporting the revolutionaries, donating her ship to the fledgling Philippine Navy and later supporting General Miguel Malvar, this time against American occupiers. The latter took over all her properties including her Taal home and sent her away to Manila, although eventually they recognized her influence among the people of Taal and returned her to her hometown. The first house we encountered here was the Villavicencio Wedding Gift House. This residence was given as a gift by Gliceria and her husband Eulalio to their daughter. We had never entered it before so this time we made sure to explore its interior. A tour guide facilitated this for us. He also confirmed that the place is open for bed and breakfast. One of the things that immediately stood out were the beautifully ornamented ceilings and walls. These were renovated according to our tour guide although the original designs were maintained. Casa Villavicencio, the home of Eulalio & Gliceria Marella Villavicencio, is the next house down the street. It’s not open to visitors but we could still take pictures from outside. We also noticed two vintage cars in what appears to be good running condition parked inside the lot. Both Casa Villavicencio and the Wedding Gift House are still owned by the clan including restaurateur and Philippine buffet restaurant pioneer Vicvic Villavicencio. 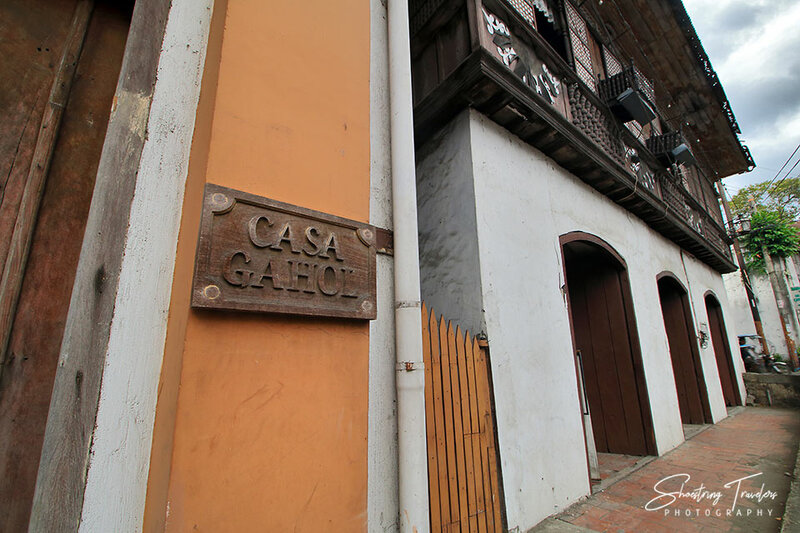 Across the street, from the Casa Villavicencio, is the Goco Ancestral House built by Juan Cabrera Goco and Lorenza Deomampo in 1876. Similar to most of the heritage houses in Taal, its ground floor was constructed in masonry while the upper floor is made up of timber. The timber used is of good quality and quite resistant to termite; a National Historical Commission staff told us that it was the replacement wood they used for restoration that got affected by the termites instead. Leaving Calle Gliceria Marella, we negotiated a short alley and emerged at the Calle Marcela Mariño Agoncillo, Taal’s main thoroughfare where majority of the heritage houses are located. The first building we ran into was the Galleria Taal, the former home of the Ilagan-Barrion family but now a museum that showcases Manny Inumerable’s camera and photograph collection (Manny, incidentally, is related to the Villavicencios). Across Galleria Taal is the Don Leon Apacible Museum, the former residence of Don Leon Apacible, a revolutionary fighter, Finance Officer of the Revolutionary Government and a delegate to the 1898 Malolos Congress. Donated by Don Leo Apacible’s heirs to the national government, it is now run by the National Historical Commission. Another peek inside allowed us to revisit the interior of the house-turned-museum – a first time for Jack and Helena who were intrigued by the combination of the houses’ 1920s Art Deco renovation and its older Spanish colonial features. …then to the Villa Tortuga, an ancestral home restored by fashion designer Lito Perez and which also houses a gift shop and photo studio where you can have your pictures taken in period costumes. Next door is the Galleria Orlina or Casa Gahol, the ancestral house and gallery of Filipino sculptor Ramon Orlina. Last on the list and at the end of the Calle Marcela Mariño Agoncillo is the Doña Marcela Agoncillo Museum, former ancestral home of Doña Marcela, another Revolutionary heroine who is best remembered for sewing the first Philippine flag right at this very house. That evening, while having coffee and a light dinner at Charito’s by Bag of Beans at Tagaytay Ridge, we reflected about some of the things we’ve learned about the prominent men and women of Taal town. Interestingly many of the leaders of the 1896 revolution from this town (and in other places in the Philippines) were from elite or affluent families of the ilustrado social stratum. Some of the latter were enticed to collaborate later with foreign aggressors. Many were also too prone to apathy, but many others like Gliceria Marella and Eulalio Villavicencio became true patriots even if it cost them dearly. And a good number of them were women, indicating once again the matriarchal nature of Philippine society even during those days. Posted in Batangas, Travel PhilippinesTagged Basilica of St. Martin of Tours, Batangas, colonial architecture, Don Leon Apacible, Gliceria Marella de Villavicencio, Heritage Town, history, Marcela Agoncillo, Philippine Revolution, Spanish era, TaalBookmark the permalink. We ran short of time to visit another Agoncillo house and the balisong shops – two other destinations worth visiting.